Our company is a reliable PSD to HTML conversion services provider with more than 6 years experience on the market. A team of devoted developers and designers from SocialEngineMarket have all the required expertise to deliver high-quality HTML coding and designs in a speedy manner at reasonable cost. Overall quality of a site depends on how the conversion process had been implemented. That's why it is important to find the coders with relevant experience and knowledge. When it comes to convert PSD file into HTML / XHTML / CSS, our company is your best choice to rely upon. Our flexible working process allows providing PSD to well-structured HTML coding worldwide. Confident specialists will assist you at every stage of the cooperation, even after the launch of the project. 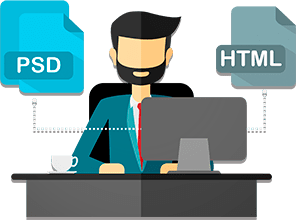 As skilled developers, providing high-quality psd to html service, we offer you convenient professional support and high-end coding results. Using the latest technologies and constantly improving our skills, we perform 100% manual, W3C valid and pixel-perfect markups. PSD (Photoshop Design) is a file format used for saving data in Adobe Photoshop. This graphics editor is crucial for web development nowadays, since with its help you can create images which later can be turned into HTML or XHTML and used on the site. SocialEngineMarket offers a wide range of conversion services, but in spite of that, as a result we always guarantee you SEO-friendly, 100% manually coded, W3C valid, cross-browser and cross-devices tested PSD to HTML / CSS, PSD to XHTML. If you don't have your own PSD design, but got inspired with the idea of HTML conversion, don't despair! A team of talented designers from SocialEngineMarket will be happy to realize your ideas. Complete the form below with you ideas or just send us an email and we'll reply asap. With years of experienced and time-proven working scheme we are able to convert any Photoshop design file to top-notch HTML, XHTML, CSS markup. Our websites coding is neat and 100% hand-coded, that's your guarantee of user-friendliness and nice look of the website. Whether you use Safari, Google Chrome, Firefox or other browser our markups will give a smooth performance. We are proud for our speciality of being attentive to details, that's a significant benefit among other conversion companies. Treating each pixel with care we deliver high-quality images, just as your initial PSD files picture. Some developers offer only multi-browser compliance, as a result applications or web pages look fine only in several browsers. Whereas our QA specialists run overall testing to ensure cross-browser compatibility across all widely used web browsers and cross-device compatibility. Only proper testing can guarantee that your site will perform properly for users worldwide. W3C valid stands for markups that have passed HTML/XHTML documents validation and are compliant with standards established by the W3C (World Wide Web Consortium). We create the markups according to all necessary requirements, therefore we avouch for the technical effectiveness of every line of code and web page you receive as a result. If you wish your site to appear among the first ones in search engines, search engine friendly coding is a must. When search engines index sites, they dissociate the HTML markup and the content. You know what articles and visual content is interesting to your users, but we can help you to boost search traffic and pages loading speed. In other words, we guarantee that our perfectly constructed corresponding all standards code will give your websites SEO-friendliness. Once you've submitted a form or sent us an email, our support team representative will contact you shortly to discuss the query. Our support is a team of tech-savvy specialists, that's why you can freely ask them possible questions and get easy to understand clear answers. We keep in touch with our customers throughout the development process to ensure proper accomplishment of every task. For your comfort we offer ongoing support, so you can rest assured that we will help you even after the work is delivered. The process of converting from PSD to HTML and CSS is not that complicated for an experienced web master. However, it is important for you to understand its stages as well. The short scheme below will provide an overview of our conversion process.